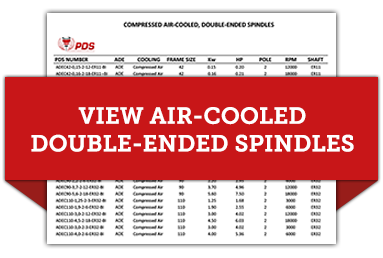 Our Bi Spindles come in two different options - Compressed air cooled and liquid cooled. For use in woodworking, plastic, and light alloy machines, the manual tool-change, double-ended (bi) spindles are designed to be cooled by compressed air or liquid. There are a multitude of possible configurations for bi spindles. View the PDFs below to view the wide range of specifications available. Give us a call today to build your own ADE-series double-ended spindle.